Maestro Rose Glo is the premier organic rose fertilizer on the market, with the highest nutrient content. 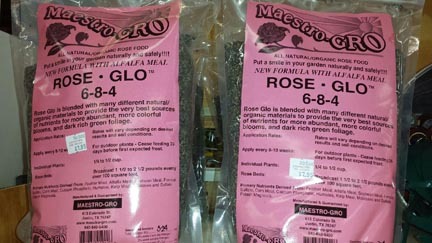 Rose Glo contains a wide variety of high nutrient materials – including humates, feather meal, bone meal, worm castings, alfalfa meal, compost – for more colorful blooms, rich green foliage. Apply: Plants: ¼ to ½ cup. Beds: 2 lbs per 100 sq ft. If you have any questions about this product or any of our other products, please call us or stop by our store. This entry was posted on Monday, September 12th, 2016 at 4:10 pm	and is filed under News & Updates. You can follow any responses to this entry through the RSS 2.0 feed. Both comments and pings are currently closed.